B 60 W 1384020207 https://www.kaercher.com/hk/professional/floor-scrubbers-scrubber-dryers/scrubber-driers/walk-behind-scrubber-driers/b-60-w-1384020207.html Walk-behind scrubber drier (60 l) with traction drive. Ideal for 1,000-2,500 m². Configuration example with disc brushes, 65 cm working width and battery (180 Ah). 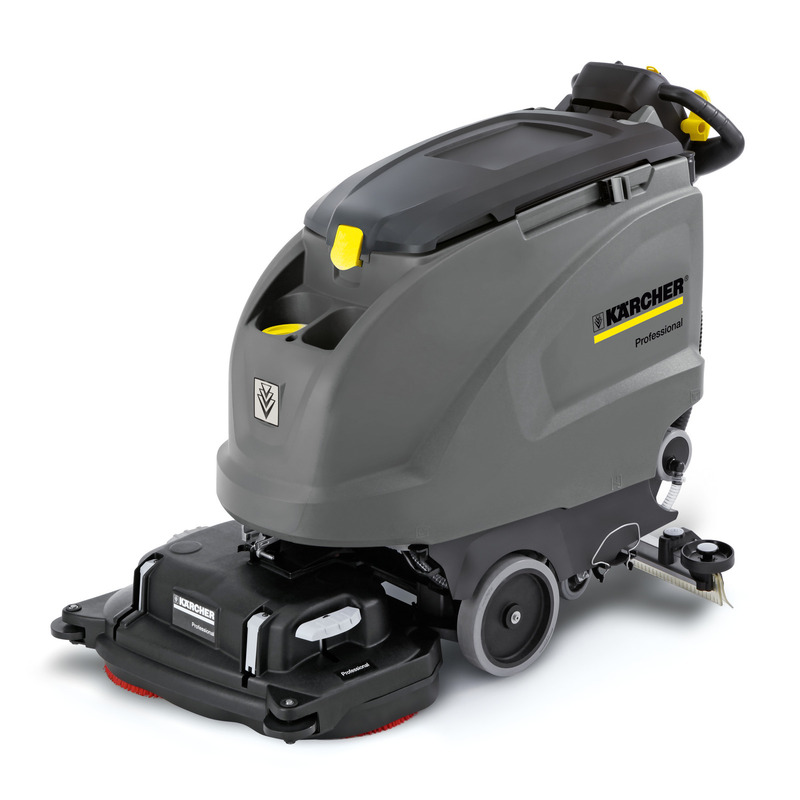 Walk-behind scrubber drier (60 l) with traction drive. Ideal for 1,000-2,500 m². Configuration example with disc brushes, 65 cm working width and battery (180 Ah). 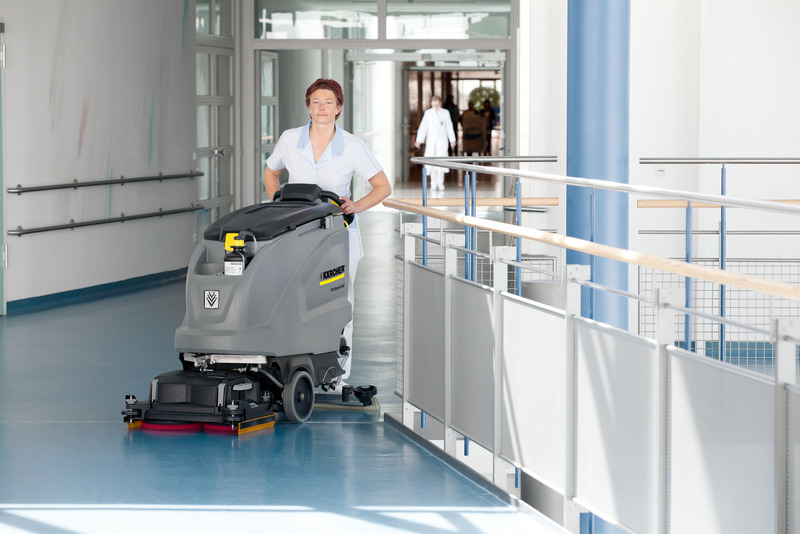 B 60 W Bp walk-behind scrubber drier. With brush head and disc brushes, adjustable brush contact pressure, 65 cm working width, maintenance-free battery (24 V, 180 Ah), traction drive and KIK key system for protection against incorrect operation. Extra feature: eco!efficiency mode extends battery life, tank rinsing system for automatic cleaning of the dirty water tank without splash back, auto-fill function for convenient filling of the water tank as well as Dose cleaning agent dosing system for direct dosing from the cleaning agent container. Tip: configuration example. This machine is available with a range of different equipment and features, e.g. different batteries, cable version or 55 cm working width. Battery types: maintenance-free 105 Ah (C5), maintenance-free 170 Ah (C5) with fleece technology, maintenance-free or low-maintenance 180 Ah (C5). Also available as a mains-operated version. Different working widths available from 51 to 65 cm. The contact pressure can be set to five different levels. Infinitely variable forward and reverse drive in battery operation. Maximum speed can be preset. Perfect suction on every floor. Various squeegee blades available: natural rubber, oil-resistant polyurethane, slotted squeegee blades for sensitive floors or closed for rough floors. Equipment features are freely selectable. Straight squeegee with adjustable support rollers, 940 mm. Supplied additional weights ensure uniform contact pressure. Grooved squeegee blades of high-quality, oil-resistant and hard-wearing transparent polyurethane, suitable for all standard floors. Easy to replace, 4x usable. including oil-resistant squeegee blades for four-fold use & additional weight for optimal gliding & easily adjustable relief wheels. Maintenance-free battery set consisting of 4x 6-V batteries with fleece technology and connecting cables. Maintenance-free battery set consisting of 4x 6-V batteries and connecting cables. Curved squeegee with adjustable support rollers, 940 mm. Supplied additional weights ensure uniform contact pressure. Grooved squeegee blades of high-quality, oil-resistant and hard-wearing transparent polyurethane, suitable for all standard floors. Easy to replace, 4x usable. Automatic filling system for quick and easy filling of tanks. Simply connect the water hose with universal quick coupling, preferably Aqua Stop, then turn the tap and filling stops automatically as soon as the tank is full. Can be retrofitted at any time. These 900 mm long, v-shaped squeegees are characterised by excellent gliding properties on all normal surfaces and especially at joints. The easy-to-change suction lips which can be used up to 4 times are grooved and made from robust, oil-resistant and transparent polyurethane with a long life. A spirit level is positioned at the squeegee which allows simple adjustment, while support rollers guarantee the proper distance to the ground at all times and additional weights maintain the contact pressure at a constant level. Last but not least, the streamlined design of the suction port prevents blockages and also improves the suction quality.